DigiTech began shipping a new pedalboard for guitarists. It allows users to play live or connect to their Mac and record their guitar sounds. The RP1000 operates in two modes. First, you can use it in preset mode that allows you to switch between preset guitar patches in the unit. The second mode is pedalboard, which allows you to turn effects of a certain preset on or off by stepping on the desired switch on the board. 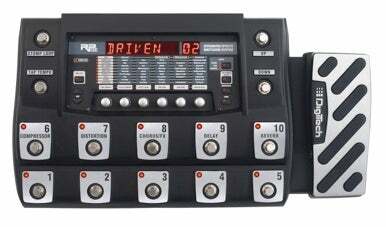 For those guitarists that wish to use their analog gear, the RP1000 comes with an amp/cabinet bypass switch. This means that the internal modeling of the amplifier and cabinet will be turned off, leaving you with just the effects. This allows you to plug into your analog amp and still use the RP1000 for effects only. With its USB port, the RP1000 can be connected to your Mac for recording or for making adjustments to the presets.